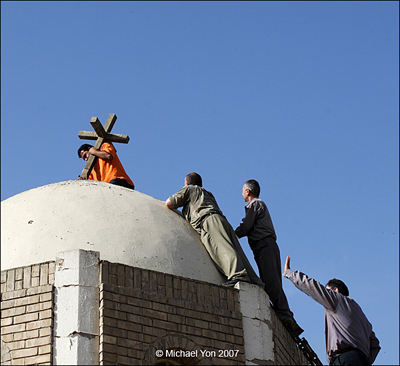 Thanks and Praise: I photographed men and women, both Christians and Muslims, placing a cross atop the St. John’s Church in Baghdad. They had taken the cross from storage and a man washed it before carrying it up to the dome. A Muslim man had invited the American soldiers from “Chosen” Company 2-12 Infantry to the church, where I videotaped as Muslims and Christians worked and rejoiced at the reopening of St John’s, an occasion all viewed as a sign of hope. cost for a limited period of time. For more information, please contact his web administrator here. There has been so much unrest in Iraq, that it may take years to reestablish stability, but every journey consists of small steps such as this one. I am grateful to Michael for being there and reporting what he sees. In my opinion, he manages to capture the humanity and inherent decency that underlies all social situations, however awful they appear at first. This entry was posted in News blogging and tagged Baghdad, Iraq, Michael Yon, Thanks and Praise. Bookmark the permalink. Thanks for sharing this. We can always use a bit of inspiration…especially about the middle east.